Looking for Fabulous Wedding Reception Centerpiece Ideas? 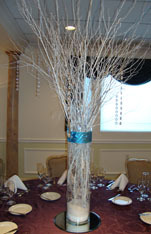 Your table arrangements will help create the look and feel that you want your reception to convey. Whether you’re looking for elegance and style or funky and trendy you want your centerpieces to be an extension of your overall theme. Before I get into specific ideas I would like to remind you that your guests will want to talk across the table. Therefore, it is important that no matter which decoration you choose, remember to keep the arrangement low and close to the table or place the centerpiece high up on a pedestal. How about this for an unusual idea? Purchase two teddy bears, dress one up as a bride and the other as a groom. 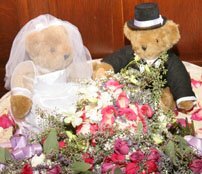 Then surround the bride and groom teddy bears with some rose petals or other small, fresh or dried flowers. If you prefer, you can set the dressed up teddy bears on a small pedestal and not need the flowers. 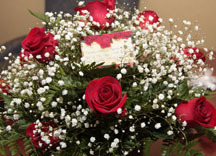 A very simple but elegant table arrangement idea is to have your florist create a small red rose arrangement and place white baby’s breath in between the roses. Prior to your wedding, write a short thank you note to your guests and have your florist place it in the center of your floral arrangement. One of my “brides” wanted something very unusual for her table decorations but didn’t want to use flowers, candles, or anything edible. My suggestion came to me when she told me she and her future husband were huge baseball fans. I bought a small wooden stand and placed a baseball cap on top of the stand. Then I surrounded the base of the stand with four baseballs. Eureka!!! The centerpieces were conversation starters and also served as the favors. If you’re looking for an elegant but inexpensive arrangement that can be made ahead of time and brought to the reception, purchase a container from a dollar store and fill it with beads, marbles or wrapped candy that coordinates with your overall color scheme. Then add some painted twigs to the arrangement. The above arrangement was simple and ever so elegant. 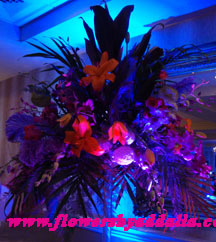 It was created by placing flowers and fillers in a square glass container. 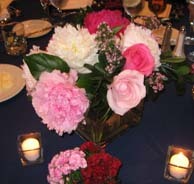 Then smaller matching glass containers were filled with flowers that coordinated with the main centerpiece. To give a soft glow, candles were placed in the same size smaller matching glass container and alternately placed around the larger floral centerpiece. If you're looking to create a more dramatic look for your centerpieces and your reception hall, consider using up lighting which can be "gelled" any color of the rainbow to coordinate with your wedding theme and decor. The gels are a heat resistant, durable film and can be mixed to create amazing colors. The picture below really pops when up lighting is used. 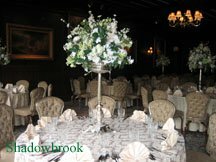 Whether you choose a simple or elaborate table arrangement, I do hope my wedding reception centerpiece ideas will help you get going on making a decision that will please you and your guests. Looking for more advice? Come check out my introductory page.